Building Maintenance Unit — Sky Rider Equipment Co. The Building Maintenance Unit, or BMU, is the ultimate solution for very tall and uniquely designed buildings. They can be installed on the main roof on a track system or on a fixed stationary position. Telescopic booms can be provided for out-reach to 130 feet and beyond. Because hoisting drums and motors are located on the roof, the platform is lightweight, and can be designed with special “approach” systems to position the platform underneath building overhangs. This system completely eliminates the need for support equipment, such as sockets and davits, on lower roofs or balconies. 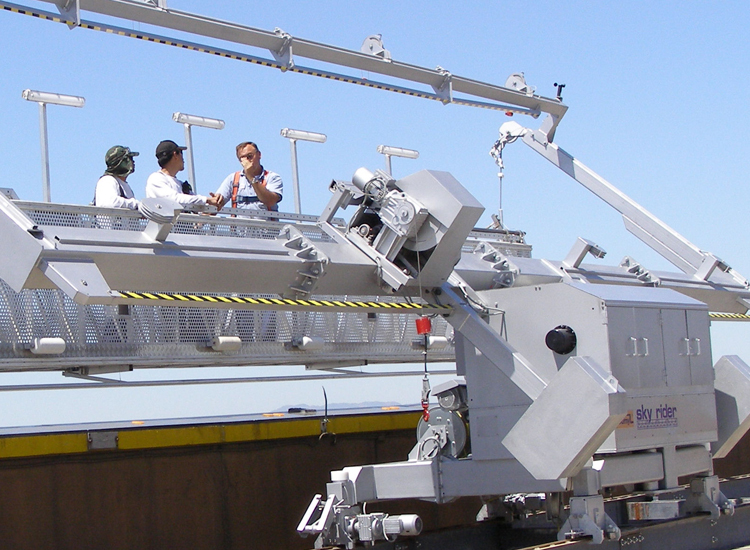 Restraint systems for buildings of more than130 feet in height.